live healthier and longer lives. Getting started in this specialized field of diet, exercise and relaxation techniques requires an understanding of the various cancers, the treatments, medications and the side effects. Not all patients should exercise, but many can and cancer doctors encourage it. As individuals or in groups, fitness and healthcare professionals are the experts to direct cancer therapy programs. Exercise becomes the focus, health (rather than sickness) the goal. It acts as an energizer, can help stabilize weight and improve the patients mood. Fitness professionals can learn how to work with this highly rewarding specialized need group through the Cancer Fit-CARE certification programs. 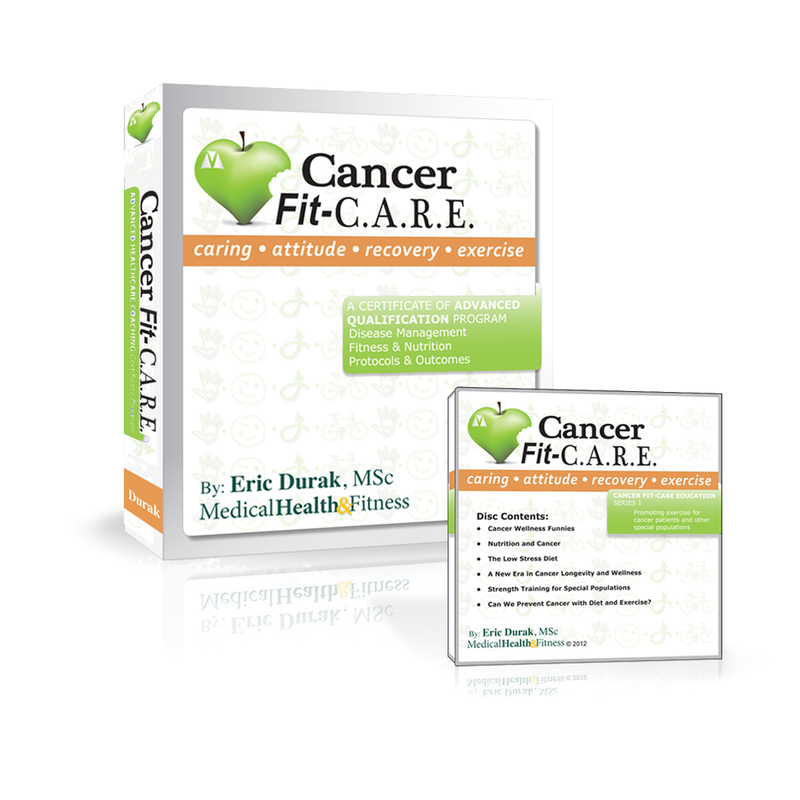 Cancer Fit-CARE Certification Manual and CD. The hallmark of our education business is the Cancer Fit-CARE program, which details the role of exercise, nutrition, mind-body medicine and the marketing of cancer wellness programs within the wellness industry. Cancer Fit-CARE was created in 1999, now in it's Sixth Edition, this certification program is one of the nation’s top medically-based wellness education programs. It includes the Fit-CARE manual, online education modules and CD with presentations for instructors. The Certification Exam and return instructions are emailed directly to you. From research to clinical practice, health club programs to national workshops, MedHealthFit has promoted wellness as an integral part of the standard of care for cancer recovery. With our latest edition of Cancer Fit-CARE, and our value-added programs with Step One Health and the Cancer Fit-CARE Coaching program, we are entering into a new era in exercise for cancer care. Our mission is to bring cancer wellness exercise and nutrition standards of care programs to the forefront of the health and fitness industry. Cancer Fit-CARE Coaching Certification Manual. Professionals who are interested in more client referrals and working with clients independent of a club setting should consider lifestyle interventions coaching. For instructors who wish to work one-on-one or in the group setting with patients outside of the club setting (via phone and skype), we offer Cancer Fit-CARE Coaching, a comprehensive supportive care program that provides a personal intervention approach to successful recovery care using exercise and nutrition. This coaching program will help those living with cancer take an active role in achieving a healthier body and strong immune system. Cancer Fit-CARE Coaching incorporates the strength of independent lab testing through our affiliate partner – StepOne Health (steponehealth.com) and incorporates specific nutritional supplements based on lab results. It is a comprehensive approach that uses exercise, nutrition and personal intervention to increase the odds of long-term survivorship of cancer survivors. Those living with cancer can take an active role in achieving a healthier body and strong immune system through the Fit-CARE personal intervention program. Fitness professionals can successfully broaden their expertise and client base through Cancer Fit-CARE Certification. Health and fitness professionals who want to grow their wellness business through the MedHealthFit comprehensive certification programs, lab testing and result driven exercise and nutrition guidance. Cancer Fit-CARE and Cancer Fit-CARE Coaching programs will benefit current cancer-certified trainers, oncology nurses, counselors and navigators who work with cancer patients and survivors.